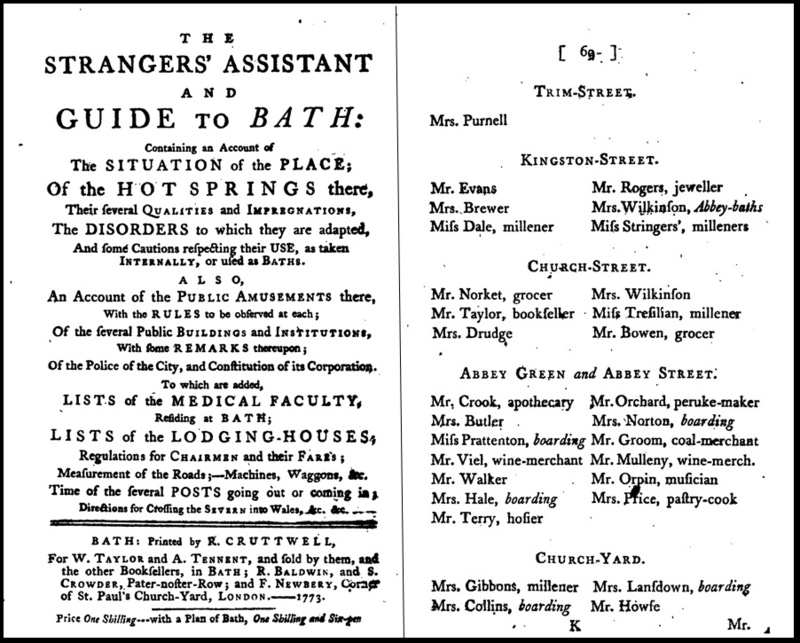 I have written much of the RIDOUTs of Bath, the first of whom came to the city in about 1805. These folk belong to my maternal grandfather’s side, having originated in Sherborne, Dorset. My maternal grandmother’s side came from rural Somerset and did not experience city life until quite late in the 19th century. Indeed, as I looked at all the families allied to the Ridouts, none had deep roots in Bath, which meant that in the early days of my research I never looked far back into Bath’s history, except through my own natural interest in the place. Than I found the ORCHARDs; ‘true’ Bathonians at last! My mother’s paternal great-grandmother was baptised Laura Ann ARCHARD on 27th December 1827 in St Mark’s church, Lyncombe. Her father was Charles and he was a coachmaker and at the point when Laura was baptised the family were living somewhere along the Upper Bristol Road towards Weston, on the opposite said of the River Avon and some distance from the church. Over a twenty year period all Charles’ children were baptised at St Mark’s, so they must have felt a great affection for this small church. But Laura’s story is for another time; just recently, I have looked at her more distant family, back in the 18th century. In those days, the ARCHARDs were ORCHARDs and, if you can pronounce the word ‘orchard’ with a strong Bath accent, you will understand why. An Orchard line that appeals to me immensely is that of the peruke makers. During most of my family history research I’ve either been sneezing from clouds of sawdust or wiping mud from my boots but here is something fresh and exciting: hairdressing! For the moment, the line starts with Joseph, who would have been Laura’s great great grandfather’s brother. The peruke [Old French perruque, head of hair; Old Italian perrucca] or periwig was a hairpiece worn by men in the 17th and 18th centuries which was made from real or artificial hair. It is said that originally this covering was an attempt to disguise the smell and appearance of unwashed hair. Clearly the periwig also became la mode and was practically obligatory for men in high social positions. 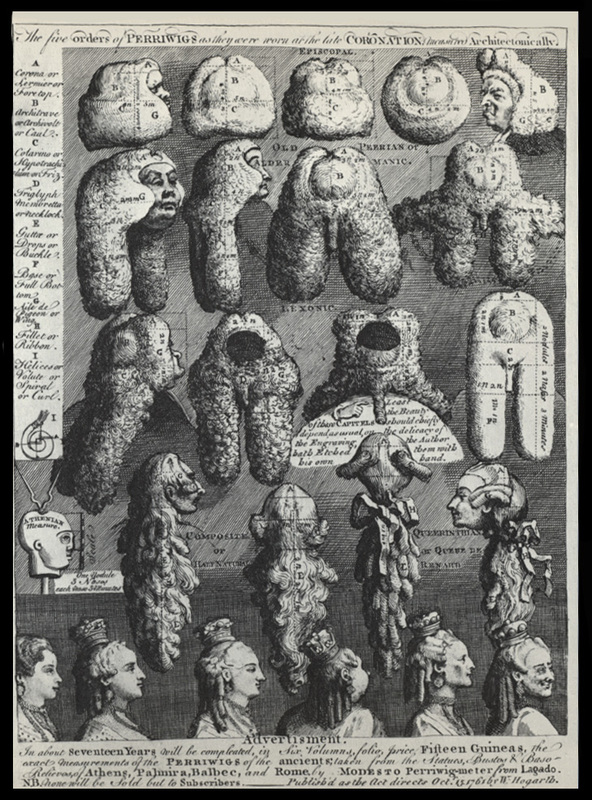 Like most fashions though, these hairpieces did become rather absurd at times, as depicted by William Hogarth’s satirical sketch ‘The Five Orders of Perriwigs as they were Worn at the Late Coronation Measured Architectomically’ (1761). All that aside, it seems that the peruke maker was a truly skilled man and probably earned good money if patronised by the gentry. One can imagine the demand in fashionable Georgian Bath! Joseph Orchard was possibly born in Bath in about 1700. There is a baptism in the Abbey in 1699, to Thomas and Elizabeth but frankly I have no idea if this is relevant. All I have seen recorded of Joseph is in the recently released online apprenticeship records. The family of an apprentice paid for a son or daughter to undertake seven years training with a master craftsman. At some point, not necessarily at the start or end of the apprenticeship, the master had to pay tax on this sum of money. The records show the name of the apprentice (and sometimes of his or her parent), the master and the date the tax was paid. From these records, I could see that Joseph was listed as ‘barber’ in 1724, after having taken on young William England, then as ‘peruke maker’ in 1729 and as ‘barber and peruke maker’ in 1738. Since he appears to have fathered at least six children, I have rather assumed that Joseph married at some point, possibly in and around the early 1720s, but I’ve not found a marriage in any of my records or online. Joseph’s first born son (perhaps) was William, baptised at St James’ church in January 1728. Old maps of Bath show this building at the foot of Stall Street, just inside the city walls, next to the medieval South gate, through which the road continued on towards the River Avon. In days of old, once St Lawrence’s Bridge was crossed, the weary traveller left Bath and entered the lawless territories of Lyncombe and Widcombe! In the 1720s, however, as Bath stone was being quarried up in the hills of Combe Down and used to develop the Georgian city, so this rural area was growing too and eventually would coalesce with its rapidly expanding neighbour. William Orchard may have learnt the trade of peruke making and hairdressing from his father as I haven’t as yet found any record of a formal apprenticeship. By the mid 18th century, William was passing on the knowledge to his own apprentices, being listed rather delightfully as a ‘perriwig maker’ in the 1753 tax records but rather more prosaically as a ‘hairdresser’ by 1789. The very excellent Georgian Newspaper Projecthas given me a great deal of information with which to identify William’s business premises; which may also have been Joseph’s. The clue came from an advertisement, published on the 9th November 1780, describing the letting of a public house called The Raven in the Abbey Green. Details were to be had from the gentleman next door – Mr Orchard, peruke maker! 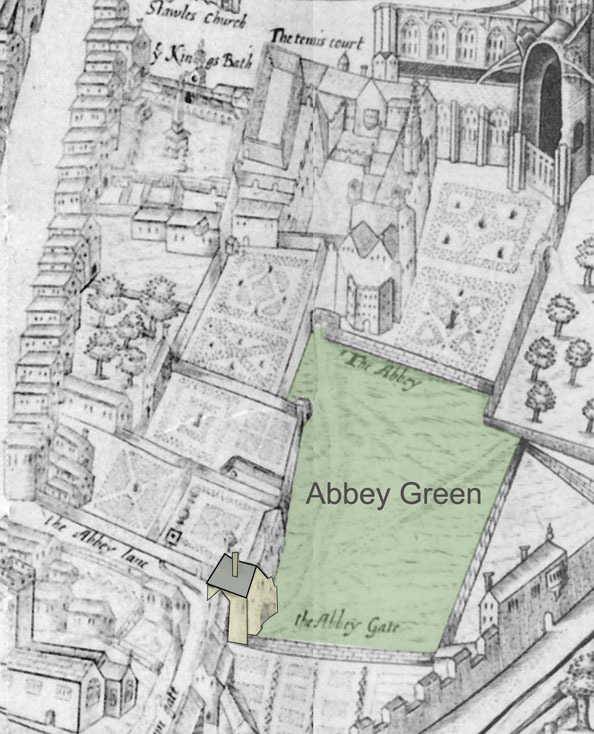 Abbey Green, a charming, oddly shaped square is still there, with its massive plane tree in the centre (no more than a twig perhaps in 1750). 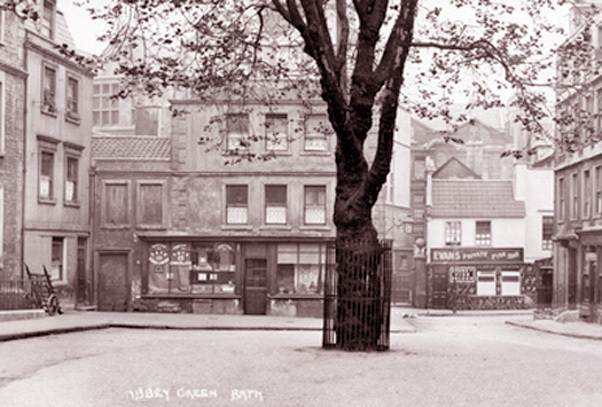 After hunting down various maps, plans and texts, it seems that The Raven public house, for those that know Bath well, was where Evan’s fish and chip shop used to be, then 7-8 Abbey Gate Street. A modern arch over the roadway, built in the 1970s, appeared to separate this building from its other half at 5 Abbey Green (which is now the NSJ Levi men’s store). Anyway, in William’s day, this large pub probably dominated the Green. 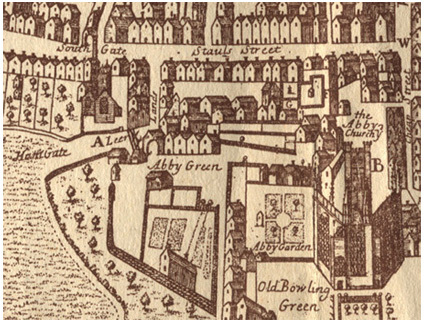 Further down Abbey Gate Street (then called Lear or Leer Lane) was the original Abbey Gate, to the side of which, and so next to the pub, was Abbeygate House. In 1753 this was divided into two dwellings, occupied by William Harding, a cabinet-maker and William Orchard. Mr Orchard is still shown here in the 1771 rate book. So, that’s where the hairdressing business was – a prime spot for passing trade and occupied in the early 20th century by the first incarnation of Evan’s fish shop. My next trip to the Bath record office, in a couple of days, will be to investigate the Orchard’s involvement with The Raven and to try and track down more hatch, match and despatches as they’re a little thin on the ground! This entry was posted in General and tagged Abbey Gate, Abbey Green, Bath, Family history, Joseph ORCHARD, Laura Ann ARCHARD, periwig makers, peruke makers, William ORCHARD. Bookmark the permalink.